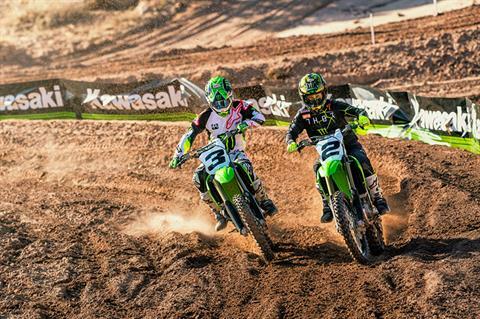 DOMINATE THE HOLESHOT: The first few seconds of the race are critical for getting ahead of the pack. 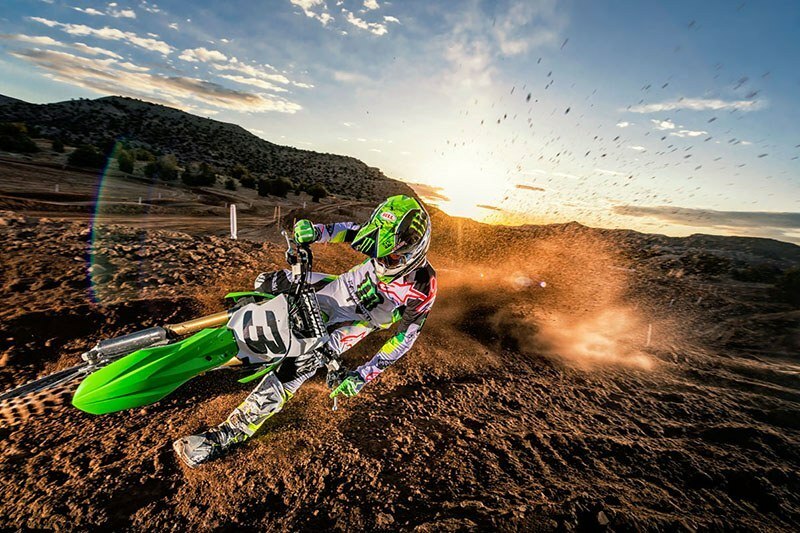 With a more powerful engine and updated technology, the time from the starting gate to the first turn just got a lot quicker. ELECTRIC START: Being able to restart your engine quickly after a stall can make or break a race. 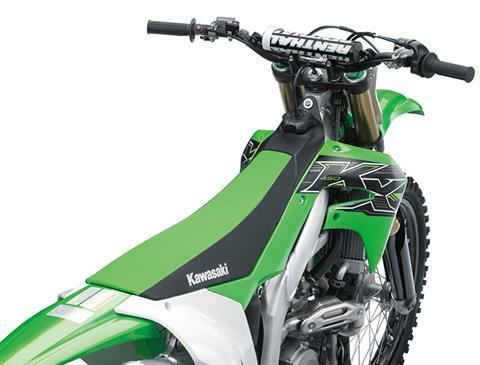 Powered by a compact and lightweight LI-ion battery a supported by an automatic centrifugal decompression system, now all it takes it the push of a button to start the KX™450. 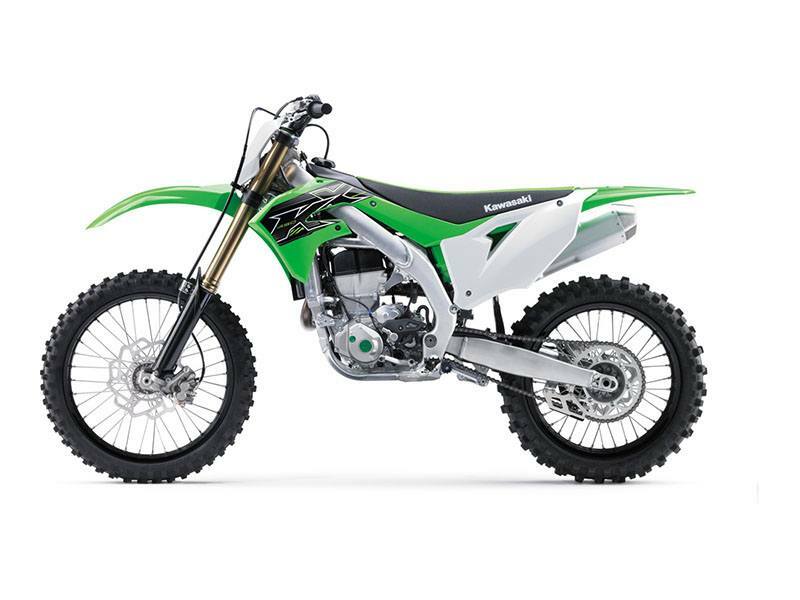 MORE POWERFUL ENGINE: Increased peak power and a flatter torque curve come thanks in part to a finger-follower valve train designed by Kawasaki’s World Superbike engineers, more aggressive cam profiles, larger intake and exhaust valves, lightweight bridged-box piston, downdraft-style intake routing, a larger 44 mm throttle body, and a longer exhaust header pipe. 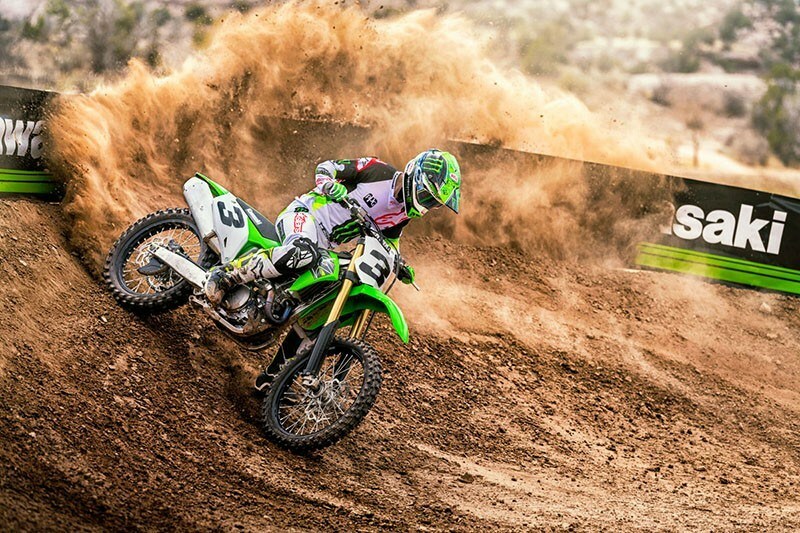 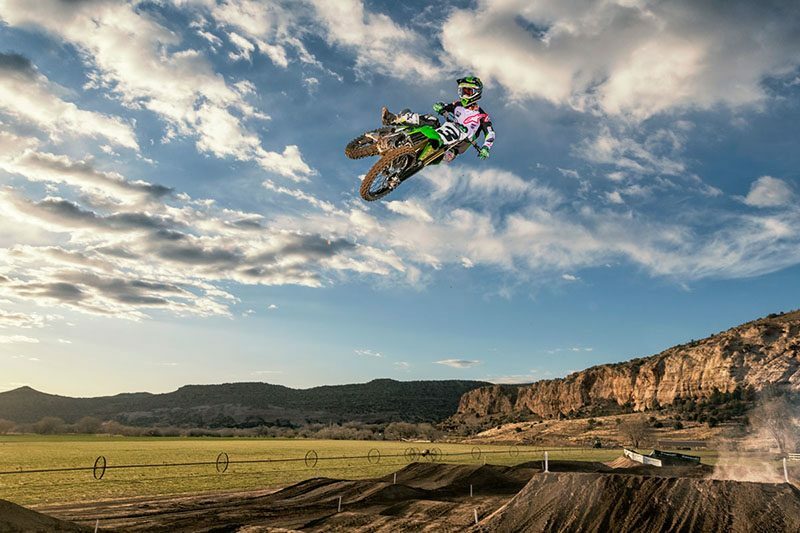 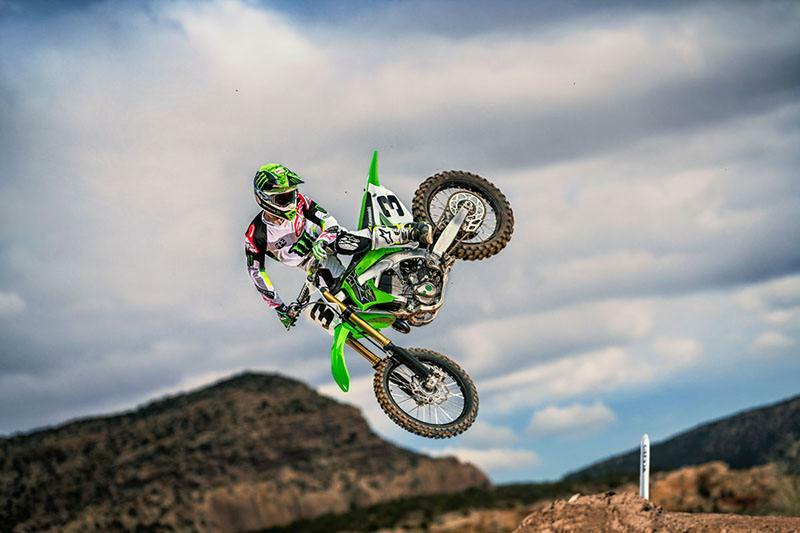 MASTER THE PASS: The KX™450 combines unmatched engine power, suspension technology, and braking ability to overtake the competition on any part of the track. 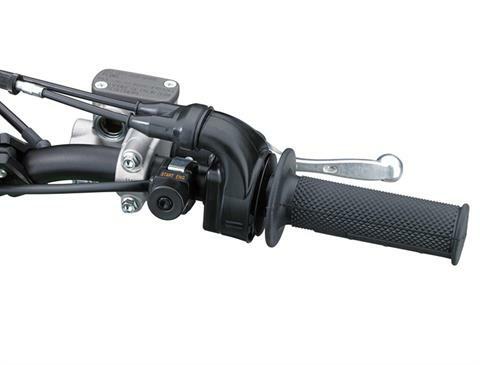 ERGO-FIT™ TECH: ERGO-FIT™ adjustable handlebar mounting system and footpegs enable the perfect fit to help you comfortably ride with confidence. 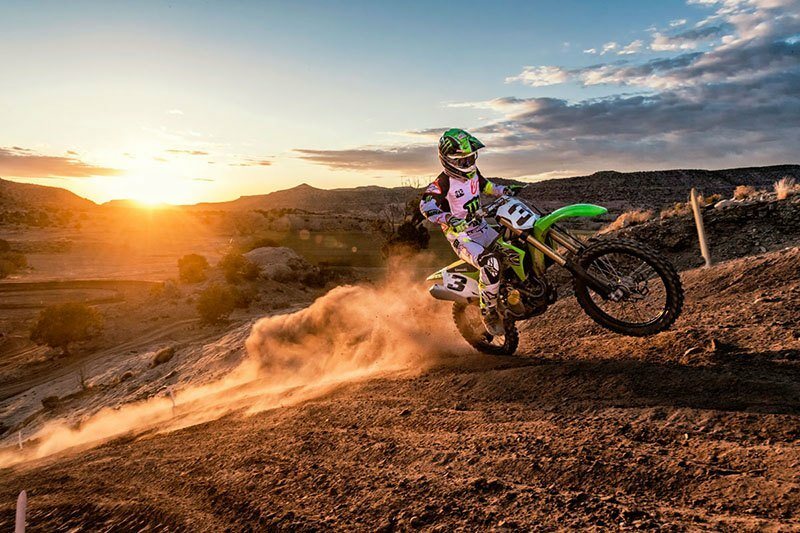 IMPROVED TORQUE: A flatter torque curve makes it easier to get on the gas sooner, delivering smooth and powerful acceleration to pass the competition and keep you ahead of the pack. 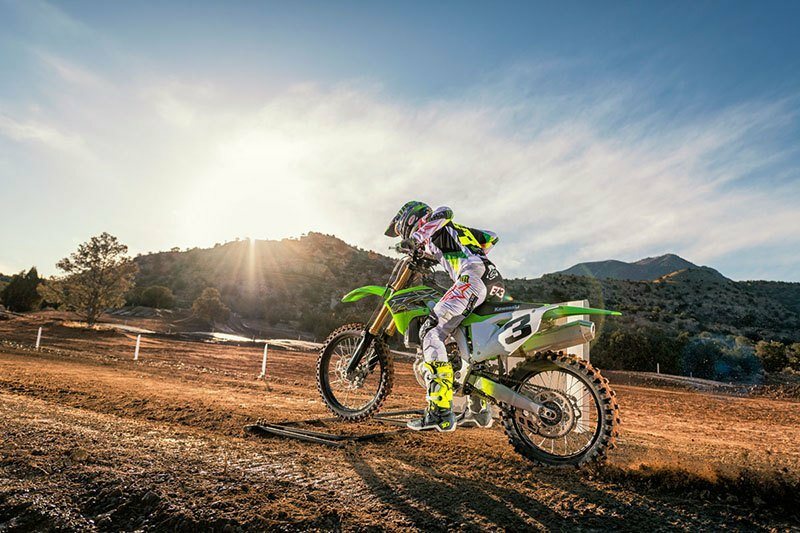 MORE POWERFUL BRAKES: The KX™450 delivers major stopping power when you need it most thanks to the new larger-diameter 250 mm petal-shaped BRAKING® rear brake rotor that complements the oversized 270 mm petal-shaped BRAKING® front brake rotor. A new front brake master cylinder offers better initial control and braking performance, while the new rear brake master cylinder and hose have been revised to reduce weight. FRONT SUSPENSION: Updates to the KX™450 contribute to smooth suspension action and a better ride feel. SHOWA 49 mm coil spring front fork with A-KIT Technology. 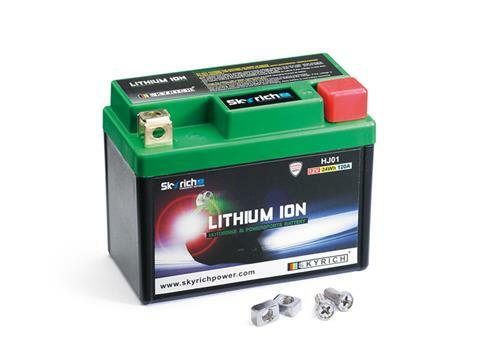 Titanium oxide coated inner tubes and large 39 mm damping pistons. 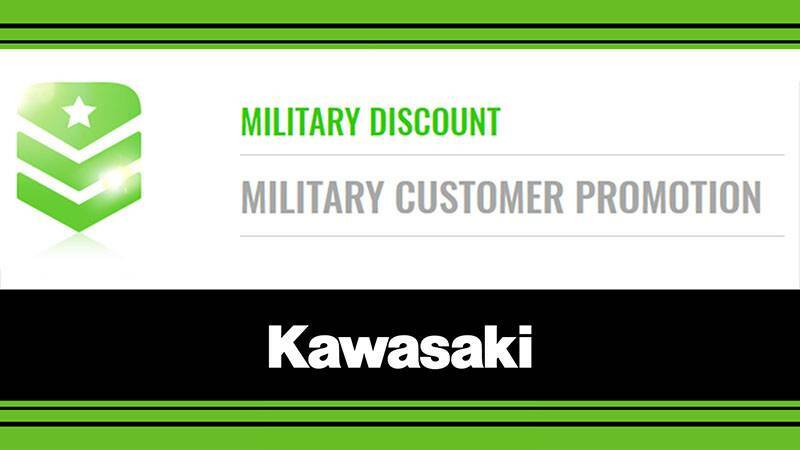 Showa Dimplush™ finish and Kashima Coat protect outer fork tubes against corrosion and prevent wear abrasion on the inner walls for a smoother ride. Larger diameter 22 mm front axle helps improve front traction. 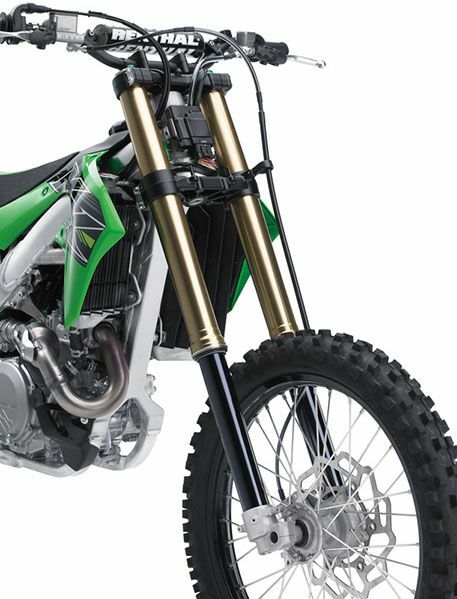 UNI-TRAK® REAR SUSPENSION: Improved damping, increased traction and more precise rear suspension tuning come as a result of SHOWA Compact Design rear shock (A-KIT technology with large 30 mm compression adjuster), slim aluminum perimeter frame and hydroformed swingarm revise rigidity to increase rear traction, 5 mm offset shock layout to optimize downdraft-style intake. IMPROVED ERGONOMICS: Redesigned bodywork better facilitates rider movement. 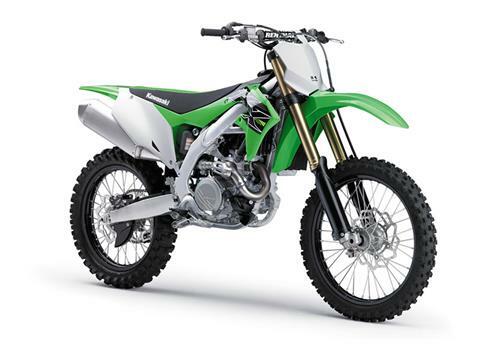 Lower fuel tank and flatter seat give the rider greater freedom of movement when changing riding position. 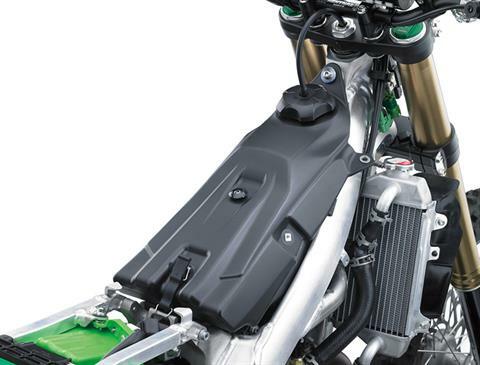 Radiator shrouds are slimmer at the rider’s legs for improved grip. In-mold graphics for an ultra-smooth surface. 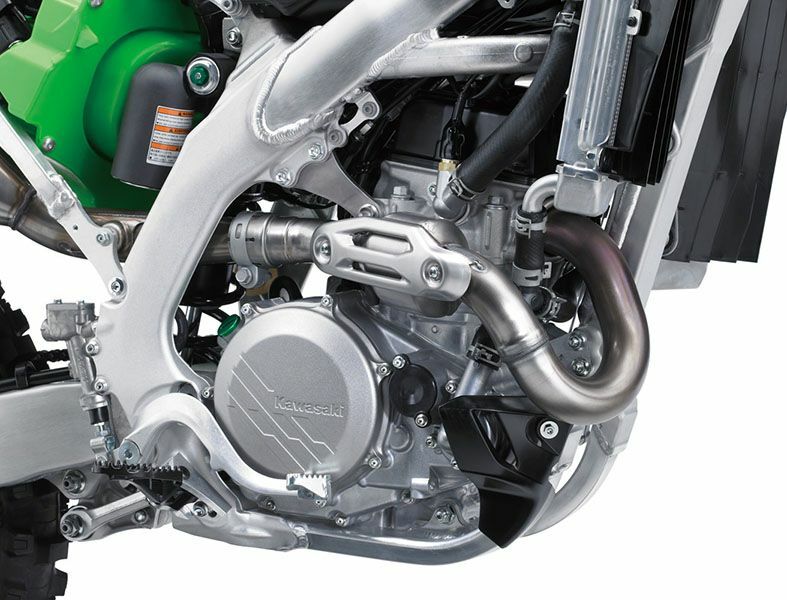 Smooth surface engine covers. Nearly flush seams between the shrouds, seat and side covers for seamless contact points. SHAVE LAP TIMES: Improvements in engine, chassis and traction performance result in faster lap times for the 2019 KX™450. 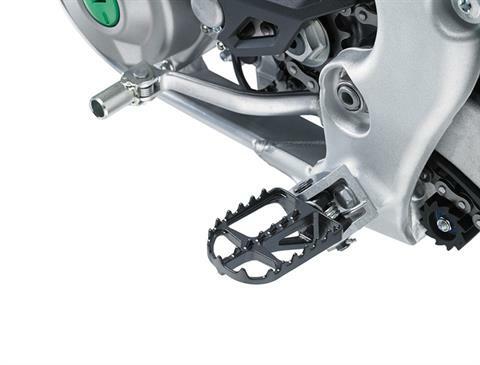 REDESIGNED FOOTPEGS: The lighter footpegs are 5 mm wider and positioned 3 mm farther rearward, offering excellent grip and making it easier to weight the pegs. REDESIGNED CHASSIS: The updated lightweight aluminum perimeter frame and swingarm increase overall rigidity balance and contribute to precise cornering through excellent front-end feel and increased traction at the rear wheel. 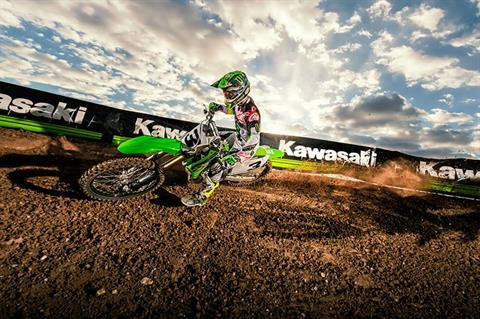 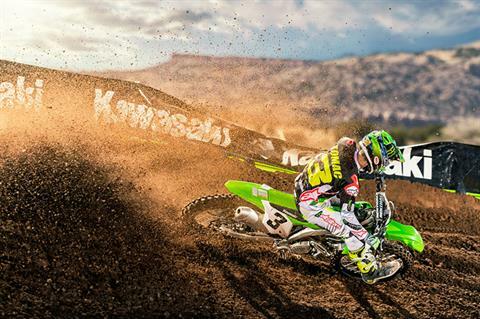 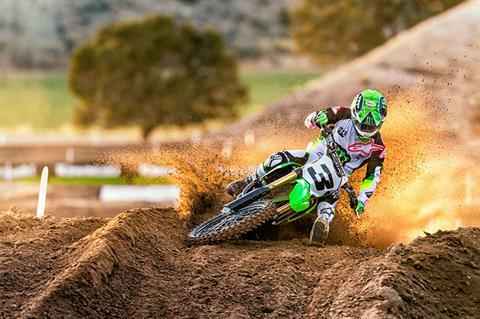 HYDRAULIC CLUTCH: Reduce lap times with Kawasaki’s first hydraulic clutch on the KX™450. 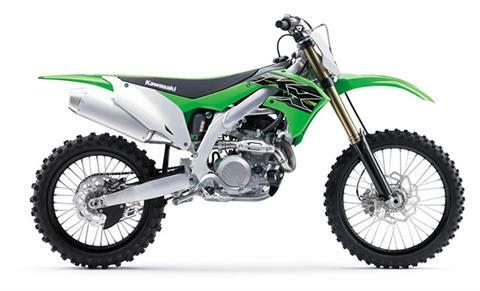 The new clutch offers a more direct feel and an easier pull for lighter lever action, helping to reduce riding fatigue. 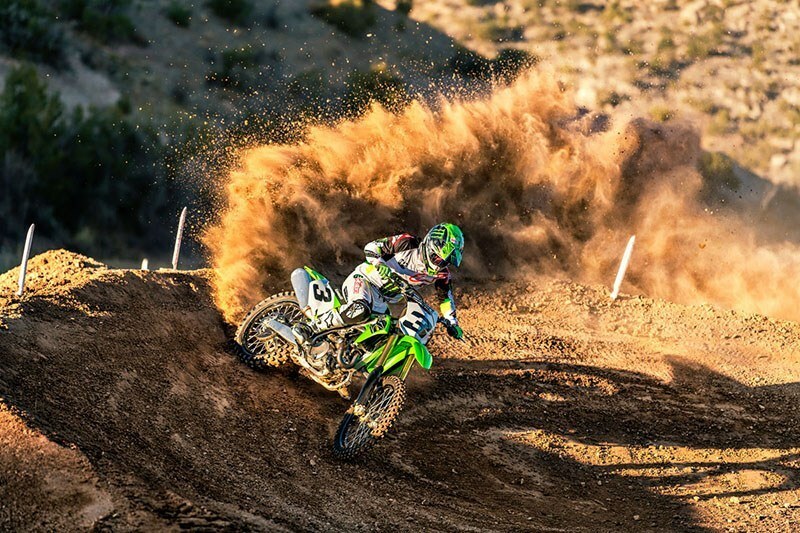 As the clutch heats up during heavy use, minimal change in clutch play provides a more consistent and direct feel. Without fuel - 232.3 lb.